Double spiral, double stem, high carbon steel bristles. 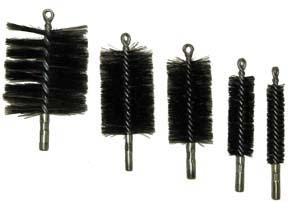 Order bore brushes the same size as your barrel ID. All brushes are slightly oversized to ensure proper surface contact. Our bore brushes are comparable to the following brands: 3M, Anderson, Boretech, Braun, Brinko, Brushtech, Carlisle, Carolina Brush, Cocker-Weber, Dremel, ElasTek, Felton, Fiberbuilt, Fuller, Goodway, Gordon, Gornell, Herold-Partco, Industrial Brush, J.A.W., Jenkins, Justman, Magnolia, MBC, Mill-Rose, Milwaukee, Osborn, Parker, PFERD, Precision Brush, Regal, Schaefer Brush, Sealeze, Solo-Horton, Spiral Brush, Stanley, Tanis, Torrington Brush, Universal, Vermont American.